If you’re up against questions like these, you have content messes on your hands. And you can bet that your prospects and customers get frustrated trying to find what they need hidden in those messes. You’re not alone. We hear these things almost every time we revamp a website. A company has built a huge inventory of content, often created by multiple authors. 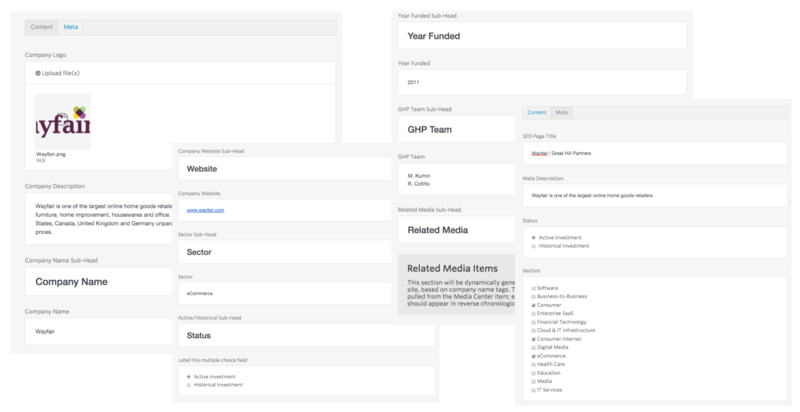 What might have started as useful, usable content created in a consistent way has turned into a mess, which is made worse when the website’s sections are owned by multiple teams. Inconsistency reigns, and the content experience suffers — either for the whole site or for a section where a visitor might expect every page to deliver the same type of information in the same way. Identify the types of content your audience needs most. Then, for each type of content, create a fill-in-the-blank template that all authors can use. A template like that — basically a form or a descriptive outline — improves the consistency and quality of your content assets. 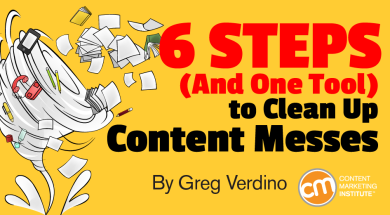 A content template is a tool your teams can use to clean up content messes. In this article, I describe six steps to create your own content templates. 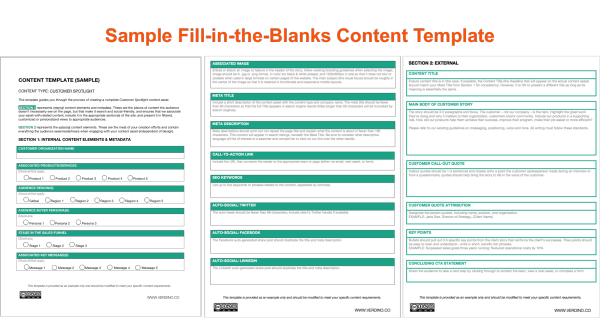 What is a content template? These three web pages were all created from the same content template. Even without reading the text, you can see that the same type of information — logo, a single-sentence description, the same six investment data points, etc. 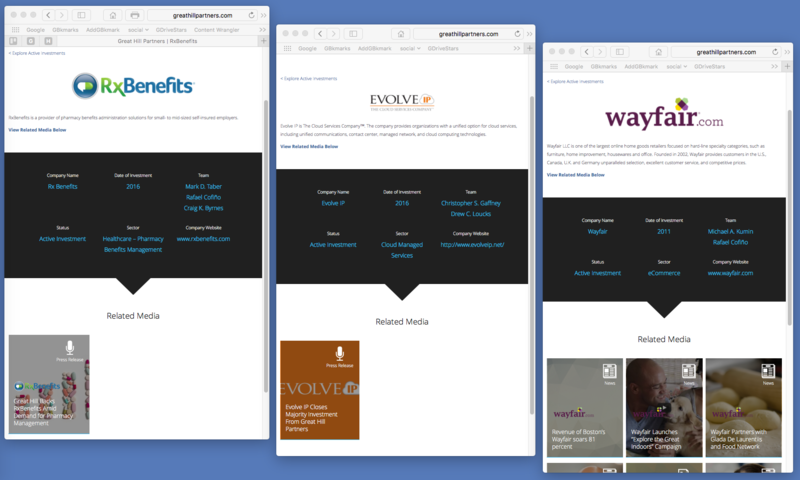 — appears in the same place, in the same format, at the same level of detail for each portfolio company. A visitor to any one of these pages knows exactly what to expect from every one of these pages. 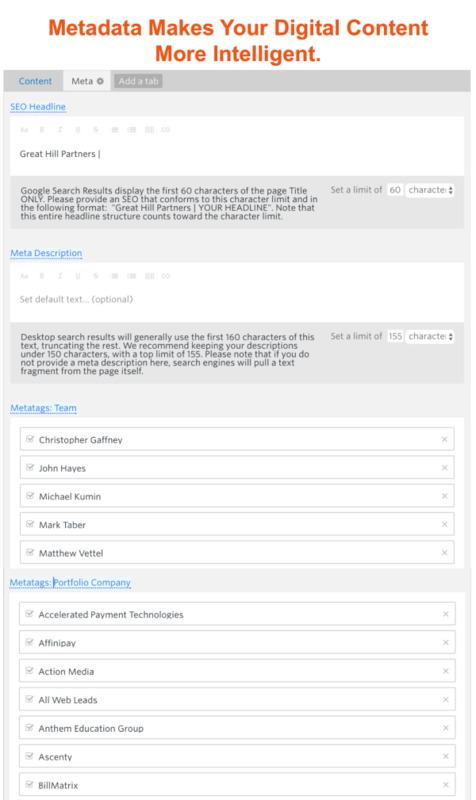 Without a template in place, every portfolio company’s page would be a snowflake, varying with the idiosyncrasies of each author’s style, format, and structure choices. A content template gives everyone a better experience. It gives authors a better experience because it tells them exactly what content to provide. It gives reviewers a better experience because it makes missing or inconsistent content easy to detect. It gives readers a better experience because it results in content assets that have the same kind of information in the same place — patterns that make reading and skimming easier. While my team often uses workflow and authoring tools when developing templates for our clients’ content, turning to technology is by no means necessary. If you’re just getting started, you can introduce content templates into your workflow without using digital tools at all; you could sketch out templates with pencil and paper. Content templates are easy for any organization to create, use, and refine, even in the absence of company-wide content management technologies. Of course, if you do have content management technology in your organization’s future, your templates will provide a useful specification for moving your workflow into your new systems. Technology takes content templates to the next level. For example, authoring software like GatherContent, and content workflow-management systems like Kapost, and many enterprise CMS like SiteCore enable organizations to set up and support — even enforce — a structured-authoring process within the platforms themselves. But if your team isn’t ready for this kind of investment, your templates alone will get you off to a good start. Content templates make so much sense that you might wonder why everyone doesn’t use them. In some cases, content owners just don’t know how to get started. Fortunately, creating your own content templates may be simpler than you think. Identify your most common types of content. Outline the elements needed in each type of content. Establish guidelines for each element. Capture the guidelines in a fill-in-the-blanks template. Roll out the template, and keep refining it. When people talk about getting started with structured content, this is what they’re talking about. You probably already have a sense of your own organization’s most common types of content (aka content types). If not, a quick tour of your own website, intranet, or content repository will help you identify specific types that you are called upon to create repeatedly or publish in a series. List the types of content you create most often. You can expand to a more comprehensive list over time. If you were to put all your instances of one content type side by side — all your blog posts, all your newsletters, all your case studies, all your team bios, etc. — would they have a similar structure? How consistent are those assets in terms of the elements of information they present, the logical flow of that information, and the level of depth provided? Will visitors understand how to use those assets to get what they need based on their experience with other similar content you publish? Are you concerned about whether your content meets an audience need completely and consistently? Vet your list of key content types with stakeholders. Refine your list based on their feedback. Think about the right level of granularity, breaking your content into the smallest logical chunks without (a warning here!) making your structure so cumbersome it distracts from the fundamental job of content creation. At this stage, it’s important to think about your metadata — the content behind the content. Your metadata makes it possible to deliver the right content to the right user at the right time. Letting the content creators across your organization know that each blog post must have a title is somewhat helpful. If you want to take your content to the next level, though, give guidelines on how to create that title. Your template is also a great place to point authors to your written tone of voice guidelines and editorial standards guide to help ensure consistency at that level, too. Now, bring it all together in a straightforward, easy-to-use content template, table or spec sheet that your authors can follow to produce complete, consistent, high-quality content every time. Download a sample template here. This content template includes elements that authors need to include in each customer spotlight (such as “content title”) as well as guidelines for each element (such as “Put the content title in title case” and “If possible, match the content title to the meta title”). Any tool is only as good as your team’s ability — and willingness — to use it. Train your people — your content creators and subject matter experts — on how they can use your templates to streamline and simplify the process of developing, reviewing, revising, and approving consistent, quality content. Make sure that the templates are easy to access. And evolve your templates as you learn what works, what can be improved, and how your content can be structured to best meet the needs of your audiences and employees. Don’t expect to set and forget. Don’t live with an outdated template just because “the template is the template.” Your needs change. Templates should be living documents. Should you apply new templates to your existing content? That’s up to you. You might want to update every historical asset of a certain type to conform to a new template. You might want to update popular assets only. You might want to use the new template for new content only. For example, while it might make sense to refresh a dozen case studies to align with a new case-study template, you probably wouldn’t rewrite 50 landing pages from 2007 to align with a new landing-page template. 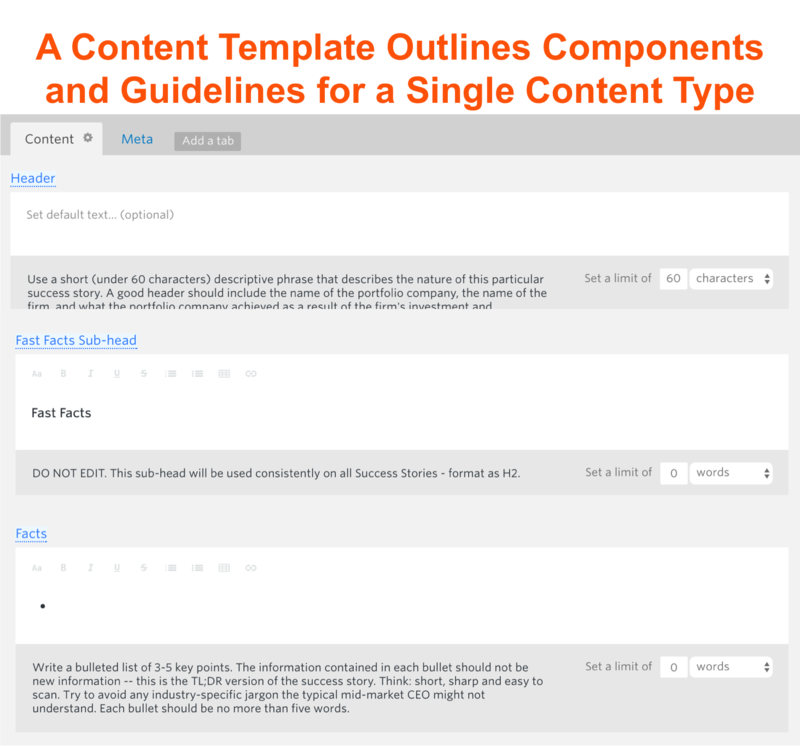 Content templates make it easier for your content creators to do their job. 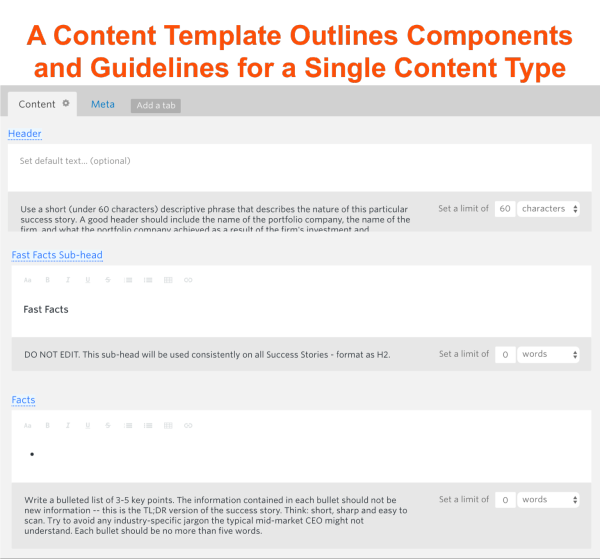 Content templates reduce the time it takes for your reviewers to do their job. Content templates produce a more consistent experience for your audience, increasing the likelihood that they’ll engage with your content and, ultimately, take the actions you want them to take. 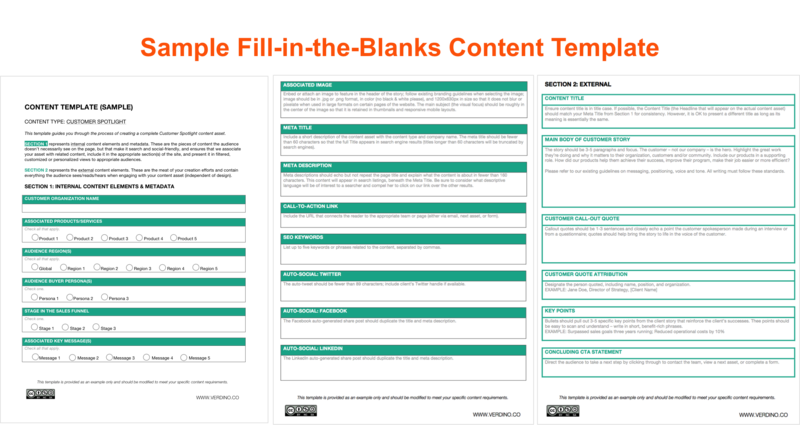 If you’re looking for a powerful tool that can help you clean up content messes — with or without the support of content management technology — give content templates a try. Want more on managing your content strategically? Sign up for our Content Strategy for Marketers weekly email newsletter, which features exclusive insights from CMI Chief Content Adviser Robert Rose. If you’re like many other marketers we meet, you’ll come to look forward to his thoughts every Saturday. Greg Verdino is managing partner at VERDINO & CO a boutique content strategy consultancy and content marketing studio that works with technology companies, financial services firms, and a select set of top B2B and B2C brands in other complex sectors. Greg is a frequent conference speaker who has been quoted by such media outlets as Bloomberg Business, Investors Business Daily, The New York Times, and The Wall Street Journal. He is the author of microMARKETING: Get Big Results by Thinking and Acting Small and a contributing author to Reinventing Interactive and Direct Marketing (both published by McGraw-Hill).